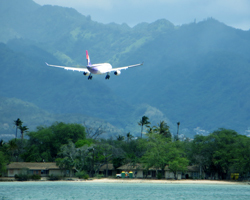 Hawaiian Airlines: 16 Reasons to Prefer Hawaiian Flights. 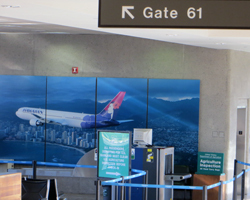 Of all the different carriers I’ve flown in and out of the Honolulu airport, only Hawaiian Airlines * makes it a point to start your Hawaii vacation from the moment you step aboard. Admittedly, I haven’t flown every airline in existence; and I haven’t done any international flights since before my kids were born (sigh), so I really can’t give a current comparison to the top-rated international airlines. But comparing U.S. airlines that offer flights to Hawaii, I’ve been on enough to know that aloha spirit isn’t the norm. For that reason, I wanted to share this list of all the reasons Hawaiian Air is my preferred way to travel between Hawaii and the U.S. mainland. For starters, you should know that I don’t work for Hawaiian Airlines, and neither does anybody close to me. So I have no hidden agenda behind giving you this information. It’s purely for your benefit in case you had questions. I recommend that you choose whatever airline gives you the best value for your money. For me, that airline is often Hawaiian, so I thought I’d tell you why. *Link opens a new window/tab. 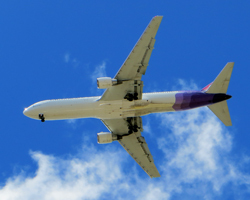 There are a lot of different airline rating statistics out there, but on-time arrival is the one that matters most for anyone who’s anxious to get out of the airport/off the plane and out to the beautiful Hawaii beaches. 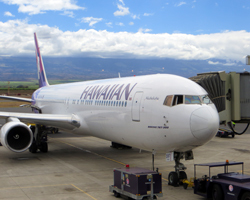 And year after year, Hawaiian Airlines sits right at the top of the list of all domestic carriers for on-time flights. I fly on Hawaiian more than just about any other airline, and I can’t recall ever having a delayed flight. Meanwhile, I’ve been on numerous delayed flights with other airlines. I prefer getting to my destinations on time. It seems like everybody has their own top-10 airlines list based on their own set of criteria. 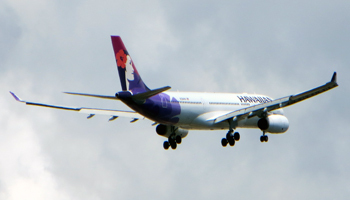 But from one poll to the next, Hawaiian Airlines is often rated among the best. 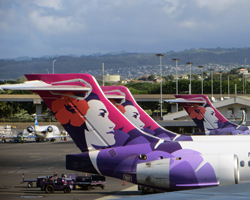 In 2013, Forbes rated Hawaiian the #5 overall domestic carrier. However, of the four higher-ranked airlines, only one offers regular flights to Hawaii; and I haven’t flown on that airline since they started upgrading their planes (because last time I did, we were delayed on the runway for a few hours). I prefer a consistent track record. No one carrier always offers the cheapest flights to Hawaii. Prices vary from day to day and flight to flight. Nevertheless, Hawaiian is almost always competitive; and you can often get a discounted airfare to Hawaii if you make the effort to find it. Although I like to get the lowest possible rates, I prefer to take the overall best flights to Hawaii. For me, that requires a combination of low cost and good experience. Scenic Hawaii sightseeing videos aren’t a big deal for me because I see Hawaii every day. But, thinking like a visitor… I can only imagine that it must be a nice treat to get on the plane and – instead of playing Words With Friends – you hear Hawaiian music while watching a highlight reel of your upcoming vacation! I can’t remember ever seeing anything like this on other airlines. And this is just one of the ways Hawaiian makes sure your Hawaii vacation starts from the moment you board the plane. I prefer having a pleasant boarding experience. Okay… this is totally subjective, but it’s still something I’ve noticed throughout the years. Hawaiian Airlines planes consistently seem to feel clean and new (particularly on the U.S. mainland flights vs. the inter-island flights). Obviously, Hawaiian isn’t the only airline that does a good job maintaining the passenger cabins. I’m just saying that I dislike flying on a dirty plane, and I never seem to have that experience on Hawaiian. By contrast, I’ve been on planes that felt old and beat-up; and the area around my seat looked like they were flying with the windows open. I endured it because I had no other choice. But I prefer a well-maintained cabin. This might not be a big deal for you; but it’s huge for me because I can’t sleep on a plane – ever. As a result, the so-called “red-eye” flights are brutal on me. I can’t say for certain that there are absolutely no overnight flights on any route, but every Hawaiian Airlines flight I’ve ever taken had me at my destination before midnight! I prefer flying during the day and sleeping in a bed when I arrive. I realize nobody ever loved airline food; and this really isn’t any better than you remember… But when you have to fly halfway across the Pacific Ocean or longer, you’re going to want something to eat. While all the other airlines have started charging extra for substandard snack boxes, Hawaiian has continued serving up the aloha with complimentary meal service. Admittedly, the fare more closely resembles TV dinners than fine dining; but this is free, and you weren’t going to get gourmet from another airline/airport anyway. I prefer to save my money for the truly enjoyable meals at my destination. This is a minor point, but for vacations to Hawaii, I think it’s appropriate to go with a Hawaiian theme on the plane. So it’s nice that Hawaiian Airlines serves snacks like passion-orange-guava (POG) juice and chocolate covered macadamia nuts. Of course you can get those things when you arrive, but why should you have to wait? When the alternative is often a bag of pretzels, I prefer Hawaiian style treats. Every airline has an in-flight magazine. 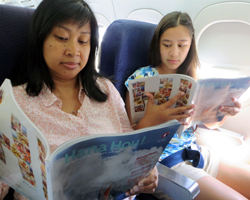 But the award-winning Hawaiian Airlines Hana Hou magazine is dedicated almost entirely to Hawaii attractions. I’ve lived in Hawaii since 1981, and I’ve discovered plenty of previously unknown Hawaiian gems in that publication. Even more so, if I was a visitor, I think I’d appreciate reading about my destination rather than all the places I chose not to go. That might just be me. But I prefer having a magazine that actually relates to my vacation. I think most airlines have started to make the switch to online check-in and automated ticketing. Hawaiian is no exception. And in the Honolulu Airport, the ticketing machines are all arranged in a couple of circles in the middle of the terminal. I don’t know if there is any research to back this up, but the process seems to move people more smoothly without the long straight lines. Again, this is a totally subjective observation. Nevertheless, I prefer checking-in without hassles. Admittedly, Hawaiian is a regional airline. 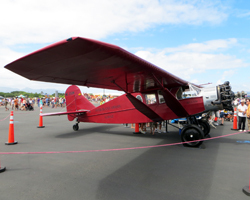 For years, it offered only inter-island flights. But over the last decade or two, Hawaiian Airlines has been steadily increasing the number of domestic and international routes to Hawaii. They don’t yet fly everywhere, but they’ve been smart and selective about adding each new destination. The growth has been slow but steady. I prefer having multiple destination choices. I can’t say that it’s new anymore, but the Hawaiian Air terminal at the Honolulu International Airport is newer than the others. As a result, it tends to be nicer. Unfortunately, however, you usually get to enjoy it only when flying inter-island. 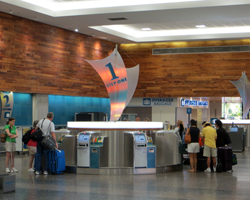 Most U.S. mainland and international flights have you check-in at the Hawaiian terminal. Then you have to walk over to one of the other terminals to catch your out-of-state flight. Nevertheless, I prefer waiting in the new terminal when I get the chance. If you become a Hawaiian Miles frequent flyer program participant, you can sign-up to receive email alerts about Hawaii vacation deals and discount flights to Hawaii. You might not even have to join the mileage program… At the bottom of the page, there’s a field where you can just enter your email address. The window of availability for these special offers is usually fairly narrow (two or three months), but if you’re flexible, you can get some real bargains! I know I prefer finding cheap flights to Honolulu. If you’re a Hawaiian Miles member, you can collect points toward free flights and other rewards. I’ve used my Hawaiian Miles for free flights a couple of times and it was without any hassle. There are no blackout dates or round-trip requirements; and it’s easy to share your miles with somebody else. By comparison, I’ve also earned free flights on one other airline, and they too were easy to book. Nevertheless, I’ve heard other people’s horror stories about having to jump through flaming hoops just to redeem their miles. I prefer a simpler reward. I think every carrier offers a credit card tied to their frequent flyer program, and Hawaiian Airlines is no exception. I know several people who have the Hawaiian Miles credit card, and they’ve all had good things to say about it. The miles add up quickly; and like I said above, they’re easy to redeem. I prefer getting rewards I can actually use. Unfortunately, I’m not a Premier Club member. 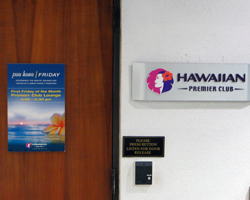 But I’ve heard from friends that Hawaiian Airlines’ Premier Club is worth the cost. I also hear that the lounges are nice – especially in the Honolulu Airport. One more reason to prefer the Premier Club is the Pau Hana Fridays… featuring free food, drinks, and live local entertainment from 4:00pm to 5:30pm on the first Friday of each month. That definitely sounds preferable to the usual waiting area. Sound good to you? Click here to Search Flights on Hawaiian Airlines (opens a new window/tab). Even though I expect that you’ll have no significant problems on Hawaiian Airlines, you might want to be prepared in case of bad luck… Let Travelex Insurance protect your trip investment starting at $20!